HÀ NỘI — VTV Bình Điền Long An defeated North Korea’s 4.25 club in the semi-final match of the International Women’s Volleyball Tournament, which is also called the VTV9-Bình Điền Cup, in the southern province of Tây Ninh on April 29. 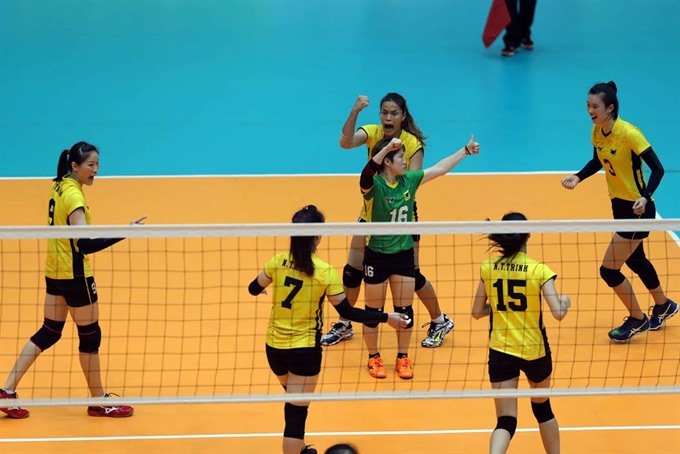 Long An dominated the first set with strong attacks and a firm defense, as more than 3,000 fans cheered them on at the Tây Ninh Gymnasium during their 25-20 victory. In the second set, Long An continued to their outstanding performance, however, they faced a powerful counter-attack by the 4.25 club. Nguyễn Thị Thanh Thúy played a strong match to help the team defeat the North Korean rival 25-23. The two sides scored each point in the final set, with Long An winning 25-21. Long An will meet Bangkok Glass of Thái Lan, who crushed Yunnan of China in the other semi-final, in the final. The 11th edition of the tournament saw the participation of three Vietnamese teams and five foreign teams, which were divided into two groups and competed in a round-robin format.